When you need foundation repair in Charlotte, North Carolina, you look for a trusted name – Tar Heel Foundation Solutions. 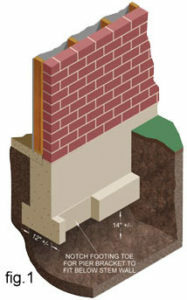 We take pride in using the latest and most up to date products on the market, which allows us to stay at the top of our game and keep your home on top of its stable foundation. We are a preferred installer of ECP, Earth Contact Products. The most commonly used item is the Model 300 steel pier for underpinning repairs. It allows your home to rest on a stable footing and hold up to its proper load-bearing standards. 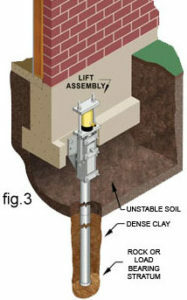 The pier is designed to drive deep into the soil to support structures from the interior and exterior of the foundation. It bypasses all of the active soils to do so. It is the leader of steel piering systems and is quickly becoming well-known for being the strongest and deepest driving pier system around. This pier is an end-bearing pier, which means that it does not rely on any type of friction to produce the support that it is installed on. All piers are load tested before being installed to assure that they meet all standards and will produce the type of support needed for the repair. The design of the pier ensures maximum weight will be supported during and after restoration and load transfer. The piers are individually driven while the entire structure is restored as a reaction. 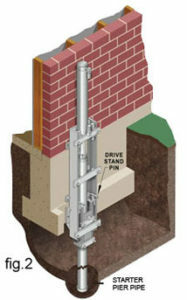 The friction reduction collar that is attached to the lead section of the pier pipe will allow for an opening in the soil to be created, which in turn reduces the friction and allows for the installer to load test the pier and verify when a firm rock or stratum is reached for maximum stability. 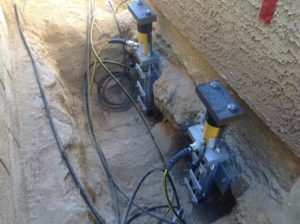 High-pressure jacks are attached in many locations around the foundation of the home and maneuvered by a hydraulic manifold. This reduces the load on the individual piers and only allows for the designed working load to be transferred to each pier. 1. Site survey: Pier placements are located and the location of underground utilities verified. 9. Clean Up: The soil that was excavated at each pier placement is now replaced and compacted. The site is left clean and neat.